The belt is a two inch wide brown leather belt with a rectangular buckle blank available from Tandy Leather. 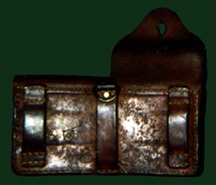 On the back is a World War II Swiss army ammo pouch with double pockets. The two other pouches on Luke's belt have not yet been identified. The leg wraps are khaki colored puttees like those worn by the British army during WWII.